Existing Driveway not centered - a problem? We have a piece of property (pasture) that is about 900 feet deep with about 1400 ft of frontage (approx 30 acres runs north to south) and are ready to build.. there is an existing driveway that goes about 200ft straight into the property - frontage on the west- about 400ft from the southern end- and goes through some nice old oak trees (about 5-6). There are other trees on the property but they are scattered and off in the field. 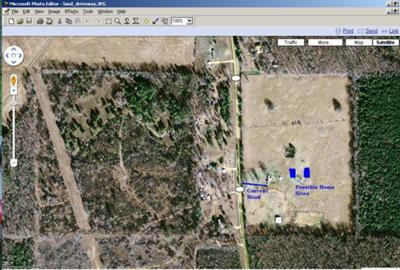 The issue is that on the southern portion of the property there are two other structures (barn and so forth) taking away land from a potential homesite, yet we actually like a place or two more out in the field better suited for the house (two places so far: one about 350ish feet off the road and the other about 500 feet - both in front of each other). The concern is that the driveway would run either straight into the garage or maybe have to "bow" out a little without ever running in front of the house. Should we possible move the driveway (SB2 - blue rock)having to build a completely new one, or try something "odd" by making it run in front of the house when driving up to the house on a regular basis. It sounds like you have a great piece of property. The driveway approach throught the oaks sounds nice. Have you considered a circular drive. This type of drive can utilize the section of the driveway from the road through the trees and then redesign the driveway close to the house. A circular drive may work well because an accessory road to the barn and other out buildings may also be able to work off of it. The approach of a circular drive does not always have to be straight. Visit the circular driveway page for some thoughts. I have designed circular driveways for rural projects and they work very well. A good thing to keep in mind when locating the house site is that an elevated site makes the house look nice and is going to provide better drainage around the house. Good Luck.